This software has multiple capabilities and relevance for business. 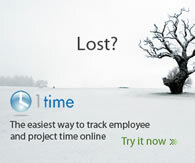 It keeps track of what your staff are doing day to day, the expense of those staff and the expenses of different projects you may have running. Particularly relevant if you are a business owner and are not in work every day â€“ what a joy that must be! Itâ€™s very easy to use and the neat thing about it is that its web based â€“ so u can use it from any location. “What is 1time? 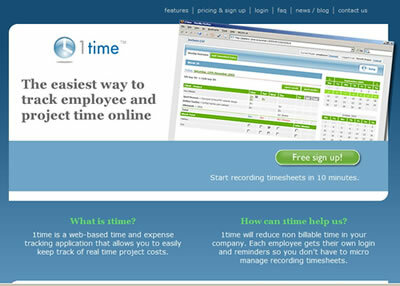 – 1time is a web-based time and expense tracking application that allows you to easily keep track of real time project costs. Pricing is in Euros but u can easily convert that to your own currency using www.xe.com. The 1 person version is free to use and gives you a good feel for the product. I found it very easy to use and now use the full version amongst our gallery staff. They are constantly developing the software and they even have their own blog. I recommend trying the free 1 person version and see how easy it is to use.